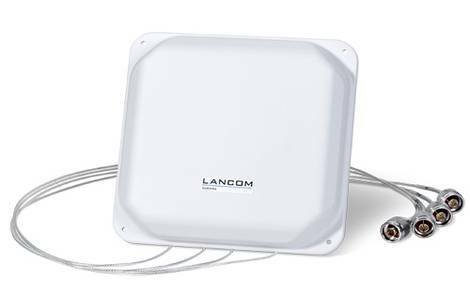 The weatherproof LANCOM AirLancer ON-Q60ag sector antenna is ideal for WLAN coverage over larger areas, including warehouses and factories. With a beam angle of approx. 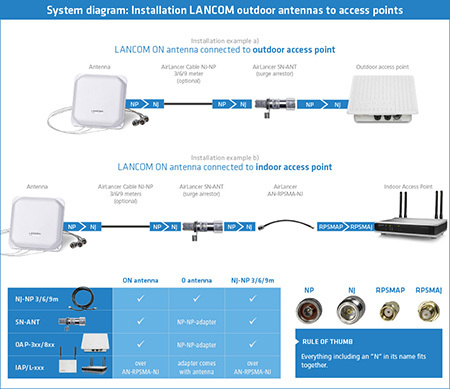 60° it is also suitable for connections to several surrounding buildings (point-to-multipoint). With 4x4 MIMO support, it ensures maximum performance for reliable WLAN client connectivity in difficult environments, especially where reflections and scattering occur. It is ideal in combination with dual-radio access points to offer parallel operation at 5 GHz with 2x2 MIMO and 2.4 GHz with 2x2 MIMO.